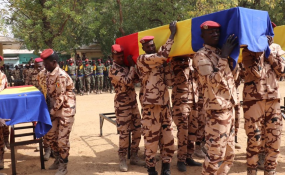 Tribute ceremony in N'Djamena for the 10 Chadian peacekeepers who were killed on 20 January in a terrorist attack in northern Mali. After 10 Chadian peacekeepers serving with the United Nations mission in Mali (MINUSMA) were killed in a terrorist attack on 20 January, the UN chief of peace operations, Jean-Pierre Lacroix, went to N'Djamena, the capital of Chad, to pay tribute to them on Monday in a ceremony organised by the Government. "I am in N'Djamena to pay tribute to 10 peacekeepers who made the ultimate sacrifice for peacebuilding in Mali," said Under-Secretary-General Lacroix on Twitter. "Their bravery imposes respect because Chad is the country that has lost the most men in combat serving with MINUSMA." The attack, which targeted the mission's camp in Aguelhok, in the Kidal region, in northern Mali, took place in the early hours of Sunday 20 January and left at least 25 'blue helmets' wounded in addition to the 10 who lost their lives. After a failed coup six years ago, a proliferation of armed groups fighting government forces and their allies in the centre and northern areas of the country has plunged the country into conflict. Today, MINUSMA is the deadliest mission to serve in as a UN 'blue helmet' with some 180 paying the ultimate sacrifice, since it was established in 2013. He also conveyed the UN's "immense gratitude" for Chad's commitment to the restoration of peace and security in Mali and the Sahel. Behind Burkina Faso, the country is the second largest troop contributor to MINUSMA with 1,450 troops and 22 policemen, as of November 2018. "We owe it to the deceased to carry out the implementation of Mali's peace and reconciliation agreement, re-instate the rule of law and enable at last economic development," stated Mr. Lacroix. "I am confident that with the participation of the parties to the agreement and our partners, we will meet these objectives."